Gett: The Trial of Viviane Amsalem is a keenly written, superbly acted film that chronicles the five-year process for an Israeli woman today to obtain a divorce from her neglectful but possessive and stubbornly resistant husband from whom she has been long separated after raising their numerous children and working outside the home throughout the marriage. 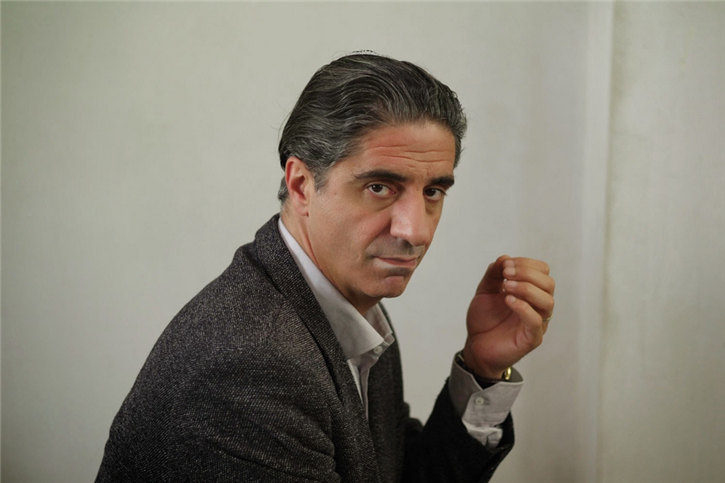 Brother and sister team Ronit (who plays Viviane) and Shlomi Elkabetz, who both do the writing and directing, have now completed a trilogy with Gett… that began with To Take a Wife in 2004 and continued with Shiva (Seven Days) in 2009. 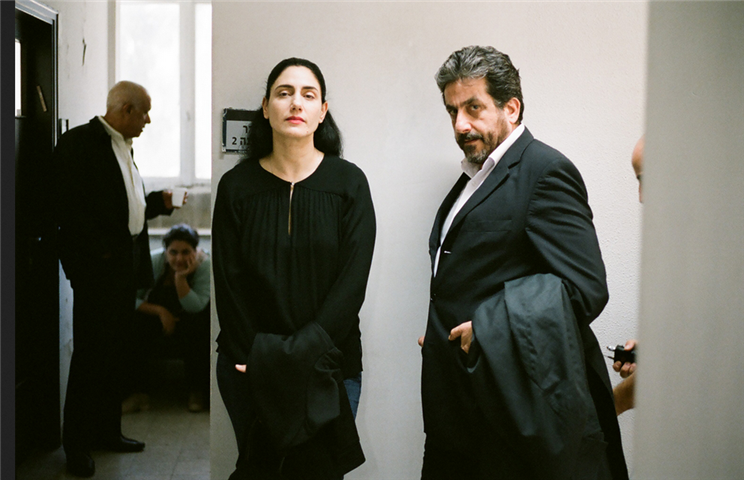 With its location restricted to one suite — the courtroom where the rabbinical jury administers the case and its waiting room — and character point-of-view shots, Gett: The Trial of Viviane Amsalem is an unusual experiment. We might expect procedural dialogue and a camera style of close-ups for a psychological drama, but this tour de force really comes down to what is not said and shown as much as what is. In fact the film sometimes slides intriguingly out-of-genre, bending toward outrageous satire with surprisingly barbed wit. To Take a Wife takes place in1979 in Israel, where hairdresser Viviane (Ronit Elkabetz) fights for her individuality in a household with an oppressive, conservative husband and his live-in mother. Viviane’s old lover surfaces and adds fuel to a combustible configuration. In Shiva (Seven Days), Viviane and her family are reunited to sit shiva for a recently deceased brother. As the Gulf War rages in the background, old family wounds fester and surface. On Sunday, Feb. 8th at 5 pm, the American Cinematheque’s Aero Theater in Santa Monica will show the entire trilogy of films in chronological order, introduced by Shlomi Elkabetz, who will be there for a discussion between the first two features. Gett: The Trial of Viviane Amsalem was offered at the recent AFI FEST Presented by Audi and is also submitted for the Best Foreign-Language Film for the coming Academy Awards. I attended a screening of the film at a venue of uncanny appropriateness, the Museum of Tolerance in Los Angeles, where co-writer/co-director Shlomi Elkabetz and actor Simon Abkarian, who plays the husband Elisha, held a lively discussion with the audience following the film presentation. Excerpts from that dialogue are included here. Audience: On the surface your film seems to use a simple style, but it is shockingly political, considering a division between secular and religious issues. How did you choose this particular story? AUD: Is your film more about religion or patriarchy? SE: Of course it’s about patriarchy, but not instead of religion. I have no choice about that — the religion is a given. AUD: Who’s the antagonist in this film? Who’s villainized? SE: I didn’t make a film about good vs. bad characters. This is a country where the law is what it is. AUD: But who’s the antagonist? Simon Abkarian: I don’t know — Elisha is trapped somewhere within himself. It’s not about him, but about what he was taught ages and ages ago. It’s tradition. Everyone’s trying to do what they can, and what they can do is very, very narrow. The story is also about love, and Elisha loves Viviane, but he gets to decide the outcome because he’s considered the strong one, and that’s not right. AUD: Does he give in at the end? SA: He’s ready to give in from the first moment, because it’s a dead end, but he’s not stupid — he knows how to read into things. And in the acting, I didn’t want to steal the emotion from Ronit (who plays Viviane). I tried to make his emotion less important than hers. The most important was her pain. SE: So we re-shot a scene with Simon’s idea of making space for her emotion. For a man like Elisha, it’s a matter of, ‘Can he be another man — a new man?’ He has to kill something inside himself for the conflict to be resolved. The moment it’s clear — that’s what we wanted to avoid. AUD: Did you do rehearsals? SE: We don’t rehearse much. Simon and I met in a bar and talked, and later we referred back to those conversations. The screenplay is so precise. SA: The good writer is the one who says the right thing at the right moment. And the good actor is the one who takes the directing exactly as directed, to the end. My job was to be less macho or strong, and more vulnerable. AUD: How was the film received in Israel? SE: It’s been out eight weeks and it’s in the news every day, because it’s impossible to get inside a divorce court in Israel. The Minister of Culture wrote about the film on a blog and invited 500 rabbinical judges to a convention to view the film. AUD: It’s a popular topic and it sparks debate. How are Orthodox Jews reacting? SE: They’ve organized some screenings. People have tried to break or change this law for 4,000 years, and in 70 years, no one ever succeeded in putting the law on the table. Maybe it will go down in history as ‘the Elkabetz Law’! AUD: What is the essence of marriage in the Jewish religion or identity? The film goes straight to the core; it doesn’t skirt the issue. I think the antagonist is the rabbinical court. The relation between Israel and the diaspora is very strong, and children from a woman’s second marriage are deemed illegitimate even in marrying other Jews. 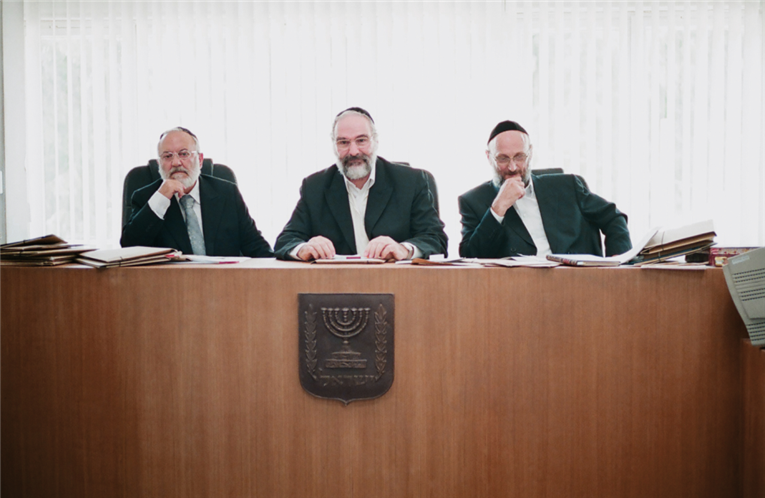 The rabbinical court is put on trial in this film — and the identity of the Jewish people. The woman becomes the sacrifice to what Judaism and God want from us, because it is promised that she will never have a relation with another man. AUD: It seems that Viviane’s shoes, her hair, the color of her dress become another character in the film. SA: As soon as you put something into a sacred context — what you believe — anything is possible. SE: I couldn’t get into the court because they won’t let you in. But we studied the law at some length, and finally we got approval. This story is personal. Viviane is inspired by our mother’s story, but it’s an ‘imaginary biography’ because our mother never went to court: she couldn’t believe that she’d succeed in getting a divorce. Once we were allowed inside the courtroom to observe a gett — the actual ceremony — we saw a man who was old, and it was impossible for him to give his wife a divorce. The woman knew that he was already not the same man as he was years ago; he had suffered some kind of trauma. When the gett finally dropped into her hands, the reaction wasn’t happiness — it was a big gasp — and that moment hit us. There’s also a case of a woman who needs a divorce but never even got married. She had relations with a man for some time, but now wants to marry someone else, and the rabbinicals say, ‘Well, we don’t know what the (first) man told you behind closed doors, so you need a gett, or the children from your coming marriage will be bastards. AUD: Does Viviane get what she fought for? AUD: What responsibility does Viviane take in the whole situation? SA: Viviane bears the responsibility of talking back, because she’s supposed to be quiet. When a marriage fails in Israel, it looks like the man’s failure, because the woman looks hysterical, though she’s not — she only wants not to be with the man. AUD: Did your mother see the film? How did she react? AUD: Your title is interesting. Do you really mean it’s the trial of Viviane Amsalem, or the trial by her? SE: We mean that Viviane Amsalem is judging society. She’s not on trial. She’s not the receiver but the doer, not the object but the subject. It’s a trial by Viviane Amsalem. AUD: What has the audience response been in general? Directors: Ronit Elkabetz, Shlomi Elkabetz; Producers: Sandrine Brauer, Marie Masmonteil, Shlomi Ellabetz, Michael Eckelt; Screenplay: Ronit Elkabetz, Shlomi Elkabetz; Cinematography: Jeanne Lapoirie; Editor: Joelle Alexis; Sound: Tully Chen, Oded Ringel, Shelly Bar-On; Music: Dikla, Shaul Beser; Production Design: Ehud Gutterman, Hagai Galimidi; Costumes: Li Alembik, Naomi Bar Or. Color, 115 min., in Hebrew, French, and Arabic with English subtitles.